The government is getting rid of childcare vouchers which will be a nightmare for many parents. Fortunately fast-acting employers can reverse the change and bolster their EVPs. Earlier this month the government was persuaded to hold off on its plans to abolish the current workplace childcare vouchers system for six months. It aims to replace employer-backed vouchers with a new tax-free childcare scheme that was launched in April 2017. However the new system has been criticised for its complexity, with Labour denouncing it as poorly understood and shoddily rolled out. Currently, those eligible for tax-free childcare receive an extra 20% towards childcare costs, while childcare vouchers enable employees to pay for childcare from their pre-tax salary. But from October 2018, no new entrants will be able to join the childcare vouchers scheme. Existing members are safe as long as their employer continues to use the scheme – and the employee stays at the company. If the family is eligible for tax-free vouchers, great. If they’re not be eligible as they were for childcare vouchers, or will be a lot worse off under the new system, it’s not so great. Which side the employee falls depends on how much they earn, the tax they pay and the amount they currently spend on childcare. This infographic, courtesy of moneysavingexpert.com, will help you figure out which system works best for your employees. Self-employed people or couples who earn less than £100,000. Parents with more than one child and high childcare costs (help available goes up with the number of children). Couples in which one parent doesn’t work (as long as the employed parent’s employer offers the scheme). 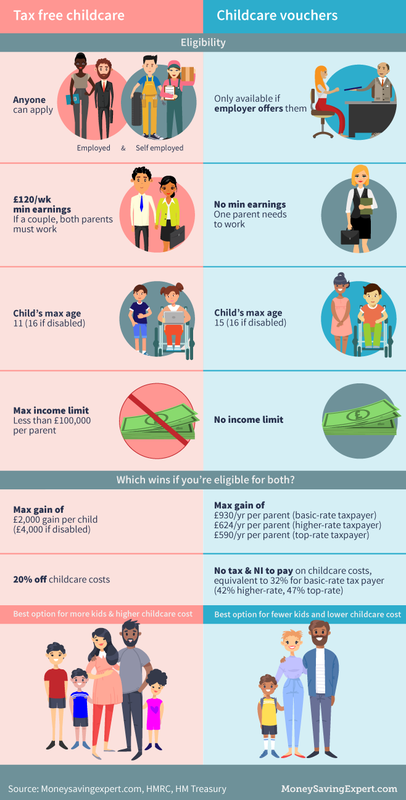 Basic-rate taxpayer parents (those earning £11,501 to £45,000) with total childcare costs of £9,336 or less. Higher-rate taxpayer parents (those earning £45,001 to £150,000) with total childcare costs of £6,252 or less. Higher earners (any one or two parents earning over £100,000+). There are two sides to this. First and foremost, if the benefits of childcare vouchers outweigh those of tax-free childcare, then it’s your duty as a progressive leader to do what’s best for our people. It just so happens that the the second side is that it works best for businesses too. As childcare vouchers are phased out of use in the UK, employers can use this six-month window to add a key component to their employee value proposition. For all the reasons above, childcare vouchers will continue to be among the most sought-after flexible benefits to attract and retain young parents. More parents are working than ever before in the UK, so it’s never been so important for employers to help support their peoples’ families – whether that’s subsidising costs or levelling out work/life balances. Childcare time typically reduces absenteeism and boosts employee engagement. Businesses don’t pay national insurance on Childcare vouchers, which can save as much as £402 per year for employees. Make sure you sign up before the end of 2018. If your organisation is already on board, then your employees are safe for as long as you run the scheme or they decide to stick with you. If your organisation isn’t on the salary sacrifice scheme, it’s missing out on the opportunity to save your employees who spend on childcare hundreds of pounds every year. Employees buy childcare vouchers and exchange them with their childcare provider in place of cash. Their childcare provider then exchanges the vouchers with Perkbox’s partner company, and takes payment for their services. Over 20,000 childcare providers accept these vouchers, so they won’t be short of places to spend them. Plus, Perkbox can arrange to make payments directly, if they’re paying the same place every month. If their needs are less predictable, they can choose to save up their vouchers and spend them whenever the choose. Summer holidays are a popular example. This is made possible because the you – the employer – buys the vouchers. The payment is taken directly from the employee’s pre-tax salary before National Insurance. As Perkbox members, employees won’t pay any administration fees directly. Instead, they’ll save 6.8% in National Insurance contributions and 2% will be paid towards their admin fees.